As 2018 came to a close we reflected back on so many things. We made so many memories in 2018! We had the opportunity to travel at least once, if not twice a month. In fact we spent over 90 nights in a hotel last year and we flew nearly 70,000 miles. We started off 2018 in sunny California on Coronado Island. We night have drank too much the night before for New Years in San Diego. So a relaxing day on Hotel del Coronado was a perfect way to kick of 2018. No better way to start the year than being on vacation, right? Shortly after the new year we took our first trip to Central America at the end of January and we visited Costa Rica. As they say in Costa Rica - "Pura Vida" (the pure life) and that is no understatement. Costa Rica was absolutely stunning, the amount of nature, wildlife, great food and eco-systems made this trip one for the books. While in Costa Rica we took time to reflect and plan for a busy 2018. We had enjoyed the trips we were able to take in 2017 and we asked ourselves, "how do we do this more?" The answer was simple, as we are both passionate about travel and helping others travel we decided to open our own Travel Agency. Thus, Virtual Travel Gurus was born shortly after our return from Costa Rica. Our biggest advice is to follow your dreams. Don't wait another day. You will look back in another year and said I should have. So just take the plunge! You are in control of your own destiny and if you choose to sit back and do nothing, then it's not ones fault but your own. In April we took Nick's Mom and Step-Dad to Washington D.C. as a retirement present. Nick's Mom and Step-dad visited Washington D.C. when they were younger. And they both wanted to go back. And we are glad we could make that happen. In July we visited Banff, Canada for the first time. Living in Idaho we thought some of our mountain ranges were pretty incredible until we visited Banff. The Canadian Rockies are so rugged and massive, it's hard to describe what it was like to be surrounded by the natural beauty. We checked off a hotel bucket-list while we were in Banff as we stayed at Fairmont Banff Springs (The Castle). Such a historic and architecturally beautiful property. We spent a long weekend hiking, soaking in the hot tub, canoeing and connecting with ourselves and with nature. Early in September we took an incredible trip to Seattle to see Ed Sheeran in concert. We then flew to another one of our favorite places, Vancouver (B.C), for a few days and then continued on to visit Iceland! Iceland is in fact a tourist hot-spot and after visiting, that is no surprise. There is no other place on earth where you can go from lush green meadows with sheep roaming free to rugged volcanic mountains to a black sand beach all within a twenty minute drive. Iceland is known as the land of fire and ice and that didn't disappoint during our visit. At the end of September we took a very romantic and relaxing trip to St. Kitts & Nevis for our 2nd wedding anniversary. We stayed at the new Park Hyatt St Kitts Resort and it was fantastic. It really gave us a chance to rest, relax and spend quality time together. Until our trip to St. Kitts we had only been to San Juan, Puerto Rico in the Caribbean but this definitely makes us want to go back and explore other neighboring destinations. Heck, give us a beach, palm trees, a pool and an ice cold cocktail and we will be happy! 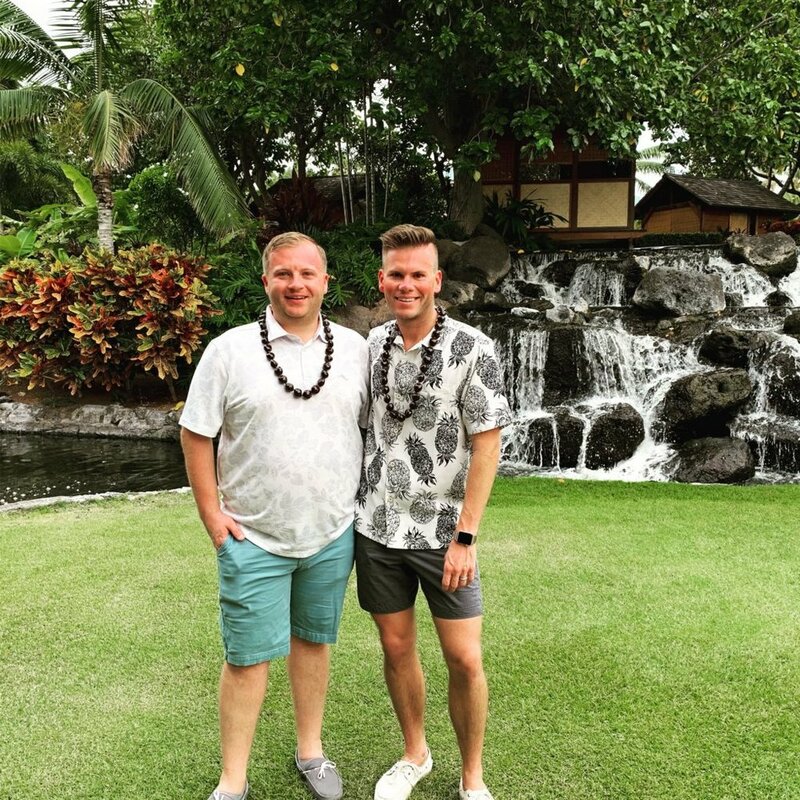 In October we visited the Big Island of Hawaii (Nick's first time in Hawaii). It was an incredible trip filled with lots of laughter, smiles and aloha. We both went snorkeling for our first time and swam right next to an endangered green sea turtle! Hawaii was so incredible, we have already planned our return trip for 2019. Madi (woof woof) turned 4 years old on the 29th of October. She has grown to be our favorite dog. Our friends and family tease us about how spoiled she is but she is our life and she is such a loving member of our family. We finished out the year strong with a trip to New York City at the end of November. New York City is incredible around the holidays! Our trips to New York City are all about eating as much delicious food as possible, shopping until we drop and experiencing all that the city has to offer. In December we visited Sonoma Valley and neighboring Napa Valley. Neither of us had been to wine country and what better way to have an early birthday celebration for Nick's Birthday than by drinking world-class wine. During our trip to wine country we learned there is more than 529 wineries, so needless to say we will be going back hopefully in 2019. Since we sold our house at the beginning of December, it didn't quite feel like Christmas to us. We decided to skip the typical family Christmas and do our own thing. The three of us (Nick, Brandon & Madi) spent Christmas in San Diego, California where it was warm and we could relax from the busy year that we had. You might be wondering, where did we go? As entrepreneurs, working full-time and traveling as much as we did in 2018, it was hard to balance everything, but somehow we managed to pull it off! Looking forward to increasing our travels in 2019.